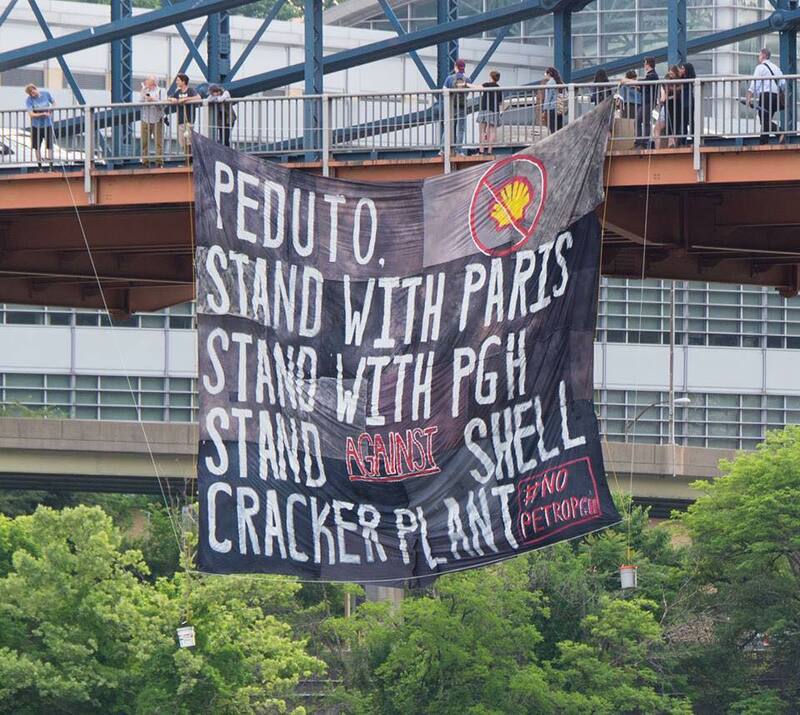 The seven-year-long battle over an ethane cracker plant between Shell Chemical, the petrochemicals arm of Royal Dutch Shell, and clean-climate activists took another turn Friday morning when a group of Pitt alumni and current students took to the Smithfield Street Bridge to drop a banner in protest of the company’s proposed ethane cracker plant being built in Beaver County. Shell announced its plan to begin building a world-scale ethane cracker in 2011, but plans weren’t finalized until the company received emissions permits from the Pennsylvania Department of Environmental Protection in June 2015. The plant will function as a production facility that “cracks” oil and natural gas to create ethylene, a flammable hydrocarbon widely used in the manufacturing of plastics, antifreeze solutions and solvents. It sits along the Ohio River in Potter Township, Beaver County — roughly 35 miles northwest of Pittsburgh and one mile from the nearest residential area. Friday’s protest was organized by Free the Planet, a student environmental organization at Pitt that works to educate the public about critical environmental issues both on and off campus. Members from United Students Against Sweatshops and Fossil Free Pitt Coalition were also present at the protest. Maura Deely is a rising senior majoring in Environmental Science and helped organize the banner drop with Pitt graduate Gerard Tessier. She said the cracker plant is a danger to the climate, and Pittsburgh specifically, due to its proximity to the facility. According to the Clean Air Council, the cracker plant is expected to emit 348 tons of nitrogen oxides, 30.4 tons of hazardous air pollutants, 71 tons of filterable particulate matter and over 1,000 tons of carbon monoxide per year. Human exposure to nitrogen oxides and particulate matter has been linked to increase risk of respiratory and cardiovascular symptoms and increased mortality rates, as stated in the CAC’s Health Impact Assessment report. The CAC and Environmental Integrity Project filed a lawsuit against Shell in 2015 to appeal the DEP’s decision to award emissions permits. In response, Shell agreed to install four “fenceline” monitors — pollution detectors that will sit along the perimeter of the facility and notify the public when emissions exceed a certain threshold. Shell has also agreed to adhere to strict regulations on flaring, a process used to burn off pollutants. A spokesperson for Mayor Peduto said that the mayor is dedicated to protecting Pittsburgh’s climate after Friday’s protest in a statement emailed to The Pitt News. The Climate Action 3.0 Plan is a recently approved measure seeking to reduce Pittsburgh’s greenhouse gas emissions by 50 percent within the next decade. Some of its goals include Pittsburgh totally divesting from fossil fuel companies, becoming waste-free and reducing water and energy usage. At a town hall event Monday evening, Peduto echoed his previous statement emailed to The Pitt News on Friday following the banner drop protest. County Executive Rich Fitzgerald was also present at the town hall and openly supported the cracker plant. “For a place like Beaver County, which was flat on its back for 30 years, it’s given them a level of hope and optimism that they haven’t seen. Having said that, we have to make sure that the EPA and DEP hold their feet to the fire to make sure the environmental regulations that are in place … are there to protect the waterways of the Ohio River,” he said. Mark Dixon, 43, is an environmental filmmaker and activist who has lived in Pittsburgh since 2006 and was in attendance at Monday’s town hall. He said he is disappointed in Fitzgerald’s enthusiasm for the plant. Deely shared Dixon’s concerns for the community as a whole, saying the purpose of the protest was to bring it to Peduto’s attention the breadth of people who will be affected by the plant.